Home Tags Posts tagged with "colds and flu"
Actress Gwyneth Paltrow, cyclist Victoria Pendleton and TV presenter Emma Forbes are all fans of Bee Prepared when it comes to staying fighting fit. Bee Prepared, a daily defence vitamin being dubbed the latest “It Vit”, is an immune support vitamin packed with powerful antioxidants and one key nutrient: bee propolis. The tablets – which come in a pack of 30 and taken daily – are designed to fight colds, flu, hay fever, and are also ideal for sports training and fitness, so it’s no wonder Olympic gold-winning cyclist Victoria Pendleton is a fan. Bee propolis is a resinous mixture honey bees collect from tree buds, sap flows or other botanical sources, and has been used to treat colds and flu, immunity, mouth ulcers and wound healing. The tablets also contain powerful nutrients such as astaxanthin, elderberry, olive leaf and beta glucans – a unique blend of ingredients from the hive, field and forest that aren’t often found in a regular diet or multivitamin. 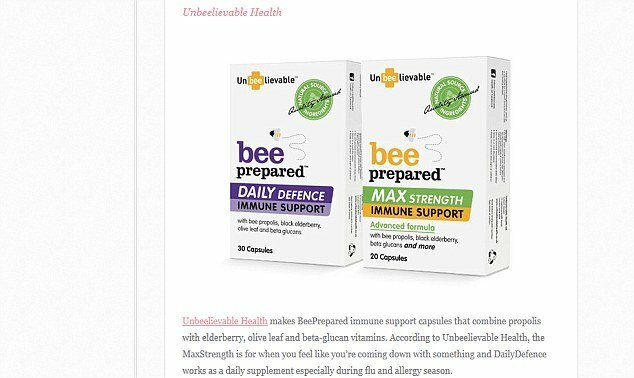 The stars take a capsule of Bee Prepared – which is available online and from health food shops – once daily to help maintain their healthy immune systems. Gwyneth Paltrow wrote on her daily Goop blog: “I was recently given <<bee venom therapy>> for an old injury and it disappeared. Emma Forbes also raved about it on her blog writing: “I am a firm believer in the power of honey. “When my kids were little I used to make something called <<mummy magic>> which was manuka honey in hot water with lemon juice. Humans have been using bee propolis medicinally for centuries with Ancient Egyptians, Greeks and Romans using it for wound healing. During both World War I and World War II, propolis was used in first aid to reduce wound infection and to speed healing. Modern day bee propolis has been used in skin care, dental care, immune support, and even cancer treatment.